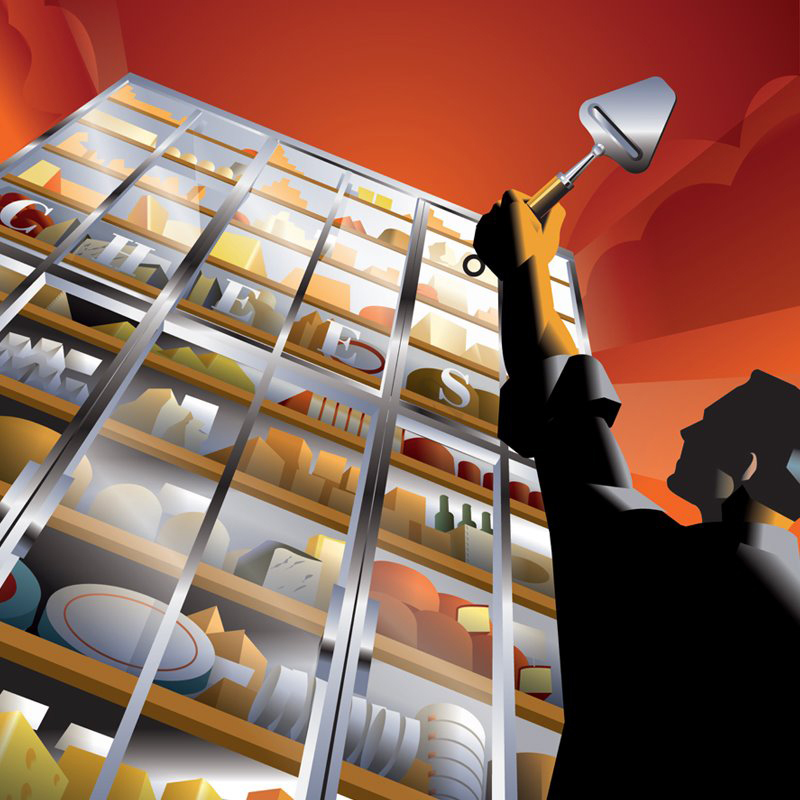 Artist's rendering of the cheese display at the new Loblaws flagship store. The Amazing Wall of Cheese. At a towering 18 feet, it’s quite a sight to see. We carry more than 400 varieties of cheese from around the globe; unique and exciting varieties that cheese lovers won’t be able to resist, including a sensational 100-pound wheel of Stilton – one of only 100 in the world – and the Canadian Grand Champion Louis d’Or. Featuring an extraordinary selection of cheeses available by the full wheel, half wheel or chunk and with a special focus on local Canadian products, our cheese specialists have created a special experience of scents, textures and tastes. One of the architects of the towering display is Gurth Pretty, author of The Definitive Guide to Canadian Artisanal and Fine Cheese, who recently joined Loblaws as Senior Category Manager, Deli Cheese. The Artisan Oven. You won’t be able to resist ACE Bakery’s renowned artisan breads. They’re made from scratch every day using the simplest all-natural ingredients. To top it off, we’re introducing ACE’s back-to-basics rustic Italian Pugliese crusty bread and other varieties made in our stone-deck oven. As the first store to feature a complete ACE Artisan Bakery, it’s a bakery experience you won’t be able to resist. Chocolate chiselled by the chunk. Our Patisserie is home to irresistible handcrafted chocolate lovingly made with all-natural ingredients. It features a mouth-watering selection of cakes and cupcakes made from scratch, not to mention, ice cream cakes, cheesecakes, donuts, muffins, chocolate pops and more. And, watch first hand as we chisel chocolate from a giant block, or as we dip fruit, pretzels and more into perfectly melted chocolate. Extraordinary egg white omelettes. Nothing starts the day right like a nutritious egg white omelette made just how you like it, right before your eyes. Our anything-but-ordinary omelettes are made using five free-run egg whites and only our freshest ingredients from throughout the store. Choose from Mushroom Herb, Asparagus & Aged Chedder, Spinach Roasted Tomato & Feta, Western with Pancetta, or Three Cheese & Walnuts. Each is served with fresh tomato salsa. Come add some magic to your morning, with chef inspired daily specials. Click here for a photo of the great wall of cheese. It must be Canada’s tallest fridge. Here’s an overview and a report on the opening. Here is Sue Riedl’as take on the new flagship supermarket in the Loblaws chain.